It took a few weeks to get through Apple’s review system, but Reeder for the iPad is finally here. Released late Friday evening, the iPad version of the popular iPhone RSS reader has been completely redesigned from the ground up—and as such, is sold as a separate app. “The iPad version wouldn't be what it is now if I just included it for free in the iPhone version,” developer Silvio Rizzi said via the app’s Twitter account, in reply to a curious consumer. 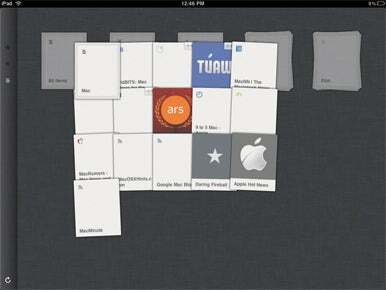 Indeed, Reeder’s iPad additions and changes are numerous, all the while still keeping the app simple to use. After inputting your Google Reader credentials, Reeder will brings up a screen similar to Apple’s Photos app, with your RSS feed groups organized into stacks. Pinching a stack open will reveal the news sources within that group, while simply tapping on the stack will bring you into a more traditional side-view. There, articles can be read, skimmed, marked as a favorite, shared through a variety of services, and more. One big mainstay from Reeder’s iPhone version is its “scroll-to-advance” feature, which allows users to simply employ a forceful scroll up or down to proceed to the next article. If you’d prefer buttons, however, up and down arrows are located conveniently on the middle left side of the app (in portrait or landscape), right about where your thumb would rest. Reeder for the iPad is available for $5 from the App Store and requires iOS 3.2 or later.